If you want the best, you're in the right place. If you want that big sound of your favorite bands, or the sounds that inspired you to write, or play, or sing in the first place, come to me at Four Legs Records. I am an experienced musician both on stage and in-studio, and have never been able to settle for anything less than the powerful, polished sound of the big bands I've been listening to all my life. It's not about your gear, your training, or even your personal connections. You need someone with an ear, and the feel for this kind of thing; true passion for music, and the ability to discern the difference between 'good' sound and 'great' sound. This is my studio. It's not just a place, it's my heart and soul. I have modified half of my gear on my own to achieve the maximum potential each piece can give. I record, mix, and master music that can stand back-to-back with anything commercially-released today, using both industry standard and proprietary techniques. My mixes have given bands and a cappella groups national awards and recognition. I'm confident that I can bring out the best in the music you've created. "There's no contest. Genius-level perfection at every frequency. Grab this guy before you can't." "Steven J Goldman is one of the rising stars in a cappella production. His work with The Funx was always tasteful and timely - a real pleasure to collaborate with! Utilizing his video feedback service allowed us to get exactly the product we were looking for in as little time as possible!" Human-Feedback, The Funx, NBC's "Sing Off"
"Pulse is brilliant. There have been few a cappella albums that have moved me so much on a visceral level from top to bottom...a master class in infusing emotion into every moment of a performance and being able to replicate it onto a recording. I would say Pulse is a near-perfect blend of sound production and music mastery." "Steve's level of attention to detail is unparalleled and he has taken the time to truly understand the group. When we record, he is able to coach everybody to bring out their strengths and ensure that they produce the perfect take- even his Mix 1's sound as if he's been with the group at every one of our rehearsals. Working with Steve is tons of fun and he makes recording and mixing sessions easy. I can't imagine having a more enjoyable and rewarding experience." "From the beautiful country setting, to the studio itself and the talented producer who runs it, Four Legs Records is by far the best experience I've had making a record. One of the first things people tell me about the album is how they can't believe the sound quality I was able to get with the modest amount I raised through Kickstarter. Highly, highly recommended for bands/artists on a budget looking for that big, professional sound." "Steve worked very hard on the mastering of my 5th CD. He was professional in very respectful of my work and vision for the project. I will be using Steve's services in the future and have already given several others his contact info to help them with their projects. The final product was punchy and smooth, I highly recommend Steve." Our self-designed, hand-built and treated professional recording studio is located in Washingtonville, New York (10992). We are capable of recording 24 tracks simultaneously on our Black Lion Audio custom modded preamps and A/D converters. We use the most accurate models of the major industry-standard analog signal processors, as well as some specialized processors and synthesizers. Check out our gear page to learn more about our equipment, microphones and process. Our recordings are warm and clear, printed to the most accurate analog console and tape models in the recording business. Our mixes are bold, tight, punchy and radio-ready. Our mastering process is in-depth when tweaking is necessary, and more transparent than just about anywhere else when it's not. For samples of our work, check out the Portfolio page. The studio consists of a main control room, a large drum room / live space with a massive sound, a group live space with treated drum alcove and couches, a solo vocal/instrument isolation booth, and a guitar/bass amp isolation booth. The building is a quiet country house, located far from any traffic or distractions. Parking is free and on-site. We have a kitchen, bathrooms, and guest bedrooms on site, as well as wireless internet access and TV. Our collegiate a cappella productions have won national awards and multiple nominations from CARA and various vocal review organizations. Our band productions have won several regional 'album of the year' awards as well as national attention in Metal Edge magazine. We not only record mix and master in-studio, but we also hit the road for site recordings. We can bring our boutique preamps, microphones, acoustic treatment, and expertise to your location in order to record. We also live-stream our mixing and mastering sessions via Google Hangouts for clients that can't be with us in-studio for the process, but still want to be present and give creative input. We offer standard hourly rates, as well as flat rates based on an hourly estimate. We also offer hourly rate discounts for groups that let us handle the production process from start to finish (record, edit, mix, master). See our services section for more information. 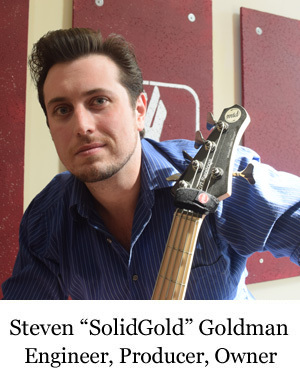 Engineer Steven J Goldman is a skilled guitarist, bassist, singer and songwriter, as well as a former drummer and keyboard player. He is experienced in several musical styles, and is a noteable producer as well as an engineer.